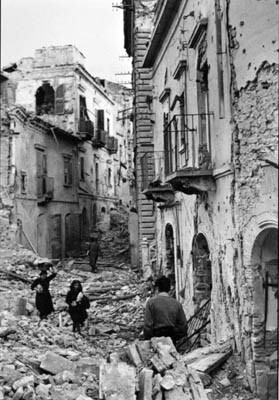 One of the narrow streets of Ortona, filled with rubble. PA-153938. “Ortona was essentially a battle-ground where success or failure depended on the individual initiative of junior leaders. Sections, platoons and companies became separate entities isolated in small worlds inside a crumbling city; dust and smoke curtained attacker and defender from beyond their immediate house or block. 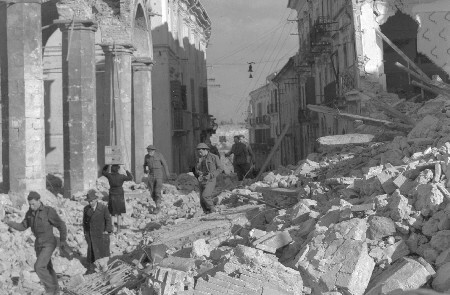 Courage and ingenuity were the essential human factors which won Ortona; for without courage, ingenious methods could never have been utilized; without ingenuity, courageous deeds lost their purpose. Battle in no way subsided over Christmas and Boxing Day. Slowly and with increasing casualties, the Edmontons forced their way towards the castle, and the Seaforths towards Via Monte Maiella.